Wood Buffalo National Park is the largest national park in Canada, established in 1922 to protect the world's largest herd of free roaming Wood Bison. Their population is currently estimated at more than 5,000. It is also the only known nesting site of whooping cranes. 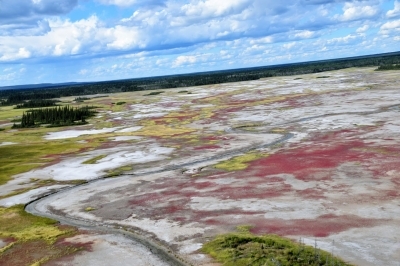 It was designated a World Heritage Site for the biological diversity of the Peace-Athabasca Delta, the world's largest inland delta, as well as the massive population of wild bison. Not one of the more remote places in Canada but still quite a lengthy drive from Edmonton unless you want to fork out the high sum to fly directly to Fort Smith (FS) and rent a car from there (I assume that is possible). It takes around 13-14h of mainly boring straight roads from Edmonton with only a few things to do on the way (60th parallel border crossing into NWT, Twin Falls, maybe Hay River if you want a longer stopover). Expect to spend at least two days here to see various parts of nature offered, more of you want to kayak. As soon as you drive in from the West, now all paved as of summer 2018, you should come across the wood buffaloes, black bears if you have some luck but judging from other's experience it is quite common, and there was also a fox. This all from just passing along the main road. On the way to Fort Smith you can also have a nice stop at the salt plains (see picture) with a big UNESCO sign. If you get in too late on the day then don’t forget to have a look on your way out of the park. Gravel roads lead southwest from FS to the karst areas, which was unfortunately mainly closed this summer due to bridge constructions or something. This would normally be an almost 20km hike to fill the day but even the mini loop holes were off limits. Pine Lake is a great area for loon watching but the mosquitoes ruined the experience a little. Taking the full length path last the lakes and back to the parking lot can once again be another full day. I also recommend Rainbow Lake if you have the time. I didn’t venture further. The park rangers at the FS center were very helpful in everything. They also have free tours as well as paid tours most days of the week, summer only of course. Mainly famous for the free roaming wood buffalo herds I found them not the highlight of the park but they make for a good roadside attraction after a long road of burnt trees. I saw 3 black bears but they like to run away quickly. 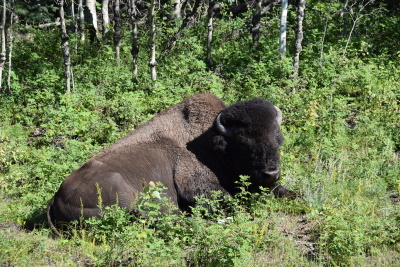 We visited Wood Buffalo Park in July 2018. It is an achievement just to get there. A long drive about 1400 km from Jasper to Fort Smith. The roads are good and paved all the way to Fort Smith. It’s a small airport in Fort Smith if you want to skip the drive, but you will need a vehicle to see the park. It’s a 120 km gravel road into the park center from Fort Smith. We stopped on night in Hay River by the Great Slave Lake and two nights in Fort Smith. The drive from Hay river to Fort Smith goes the northern part of the park. The park entrance is free. The visitor center is in Fort Smith. It was small, but informativ with helpful staff. We saw a great film about the park, 20 minutes, which explained its outstanding values. The landscape is not as spectacular or scenic as for instance Rocky Mountains, but it still has some uniqueness to it. It varies from boreal forest, karst landforms, salt plains to one of the world’s largest fresh water delta. The park is huge, Canada’s largest, 44807 km2 larger than Switzerland. We chartered a float plane for an hour to see the salt plains and the waterfalls in Slave River (just outside the park, but very scenic). Unfortunately it was too far to go down to the freshwater delta within the hour. The trip was great, fantastic views of the salt plains with lots of colors. The park is home for the last remaining free roaming wild Wood Buffalos in the world and is the only nesting area for the endangered Whopping cranes. The park is also home to black bears, moose, foxes, lynx, beavers and Sandhill cranes. Seeing animals in such a huge park is by luck only. We were lucky and saw several buffaloes and even a small herd, 6 black bears, a moose, couple of foxes and sandhill cranes, but none whopping cranes which are rare to see. There are several hiking trails in the park, but because of few hikers many of the trails are in poor condition – it’s not as in the Rocky’s. The bugs are also murderous so our attempt to go for a hike from Pine lake ended early, it was almost unbearable. The Unesco plaque is located at the lookout at the salt plains. You can get there from the main road between Hay river and Fort Smith, it’s 11 km on a dirt road. There is a path down to the salt plains. We took a short hike further on – barefoot. It was so muddy, that it was impossible with joggers. Hiking boots are recommended. From the plain we saw that the area is huge and what you can see from the lookout it’s only a small part. Another feature to the park is sink holes. Make sure to stop at Angus Sink hole just inside the park boarder from Hay river. When you’re in Fort Smith a visit to Northern Life Museum it’s worth a stop. It is free and gives a good impression about the life in northern Canada. We also recommend a trip down to the rapids in Slave River. In Slave river there are four rapids. The white pelicans are nesting at the Mountains Rapids and fishing in the Rapids of the Drowned. The last one is close to town and easy accessible on a short hike. There are few dinner restaurants in town, none very good, but we found a good coffee place with an espresso machine, The Rusty Raven Gallery & Gift. There are two hotels in town and few B&Bs. None are on Booking.com or Hotels.com. We didn’t pre-book, but we were able to get a room at Pelican Rapids Inn. We had a great stay in the park well worth the effort to get up there. Wood Buffalo National Park is the second largest national park in the world (the first being in Greenland) and it just boggles my mind that the park only receives 9,000 visitors a year. I know that it is an effort to get there. We drove for 17 hours from Jasper National Park in Alberta to Wood Buffalo's entrance in Fort Smith, Northwest Territories. We were greeted by friendly Parks Canada staff at the visitor centre and watched an informative video on the park's scenic and varied landscape. Due to time restrictions, we only visited the Salt Plains, where the World Heritage site plaque is located. This unique ecosystem supports a variety of wildlife, including bison, moose, bears, wolves, and waterfowl. Wood Buffalo National Park is also known to have the largest population of roaming bison, as well as the largest population of whooping cranes in the world. The entrance to the park is free, which is another reason to visit! When you go, make sure to go around the town of Fort Smith, where the indigenous people like the Metis will provide you with any information about the park and surrounding areas. Also, be careful driving on the gravel roads on Canadian Highway 5, which leads you to the entrance to the park. I was sad to learn from a local that the park only receives $70,000-$80,000 a year from Parks Canada to help with the maintenance of the park. This is absolutely not enough, considering the size of the park and the fact that Jasper National Park receives this amount of money DAILY! I was even more surprised to hear that the park does not receive any funding from UNESCO as a World Heritage Site. Therefore, do this park a favour and do yourselves a favour: visit Wood Buffalo National Park and journey on the road less travelled! Protection of a single named species: The Wood Buffalo/Bison (Bison bison athabascae) is a distinct northern subspecies of the North American Bison. Salt Flats: Grosbeak Lake Salt Flats "Wood Buffalo also includes salt flats unique in Canada. This strange spectacle is created as spring water brings disolved salt to the surface, covering large areas and creating pans and mounds up to 2 meters high"